Janet Brewster Murrow was more than just the wife of famed broadcast journalist Edward R. Murrow. After brief experiments with acting and teaching, she traveled to Europe and became one of America’s most trusted news writers and war correspondents. 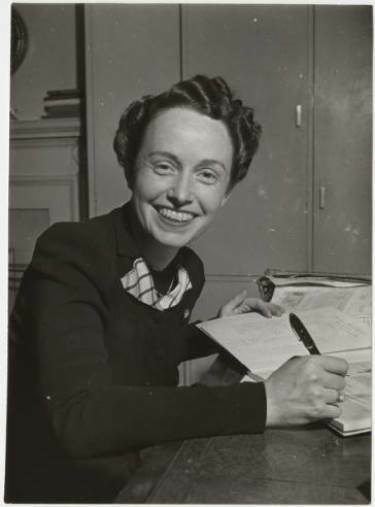 In addition, she worked diligently to bring relief to children and families in need during World War II and returned to America a news media celebrity who furthered numerous philanthropic causes, worked alongside her husband to keep Americans abreast of events transpiring around the globe, and sat on the Board of Trustees for Mount Holyoke College. A native of Middletown, Connecticut, Janet Brewster, the daughter of a car salesman, became the editor of the school magazine and head of the debate team in high school before attending Mount Holyoke College. She became president of the student body at Mount Holyoke and traveled to the National Student Federation of America conference in New Orleans in 1932 where she met her future husband, Edward Murrow. After college, Brewster taught school in Middletown before marrying Murrow in October of 1934. Two and half years later, the Murrows moved to London to allow Edward to report on events transpiring in Europe for CBS radio. It was not long, however, before Janet began writing news scripts for the BBC and made her own radio broadcasts for CBS. Throughout the war, she also wrote and edited numerous scripts for her husband’s broadcasts. In addition to her writing, editing, and broadcasting responsibilities, Murrow took an active role in child and family welfare in Europe. After the start of the Battle of Britain, she helped evacuate children from London to the English countryside, or to America, to escape the heavy enemy bombing. She also worked alongside and befriended Clementine Churchill while helping organize the London office of the Bundles for Britain campaign in which American women donated clothing, food, and other supplies for British families. The Murrows returned to the United States in 1946 and settled in New York. Janet Murrow went to work for the Henry Street Settlement to combat poverty in the United States, but still continued to make news broadcasts whenever needed. In 1953, she and Edward even reported together on the coronation of Queen Elizabeth II. After Edward’s death in 1965, Janet Murrow moved to South Hadley, Massachusetts, where she served on the Board of Trustees for Mount Holyoke College. She worked for the college’s art museum and eventually became the Executive Director of the Art Advisory Committee before passing away on December 18, 1998. “Janet Brewster Murrow.” Tufts University, Digital Collections And Archives, The Murrow Center, 2016. Link. “Digital Collection: Murrow Papers.” Mount Holyoke College, Archives and Special Collections, 2016. Link. “Finding Aid to the Edward R. and Janet Brewster Murrow Papers.” Mount Holyoke College, Archives and Special Collections, 2016. Link. “Mount Holyoke Archives Hold Edward R. Murrow Papers.” Mount Holyoke College, 2016. Link.